THERE IS A MENTAL IMAGE THAT I DON’T THINK I’LL EVER FORGET: six artists scattered across a hilltop overlooking snowy meadows bisected by the Firehole River and punctuated by steaming thermals. It’s a clear March afternoon and the snow is melting. 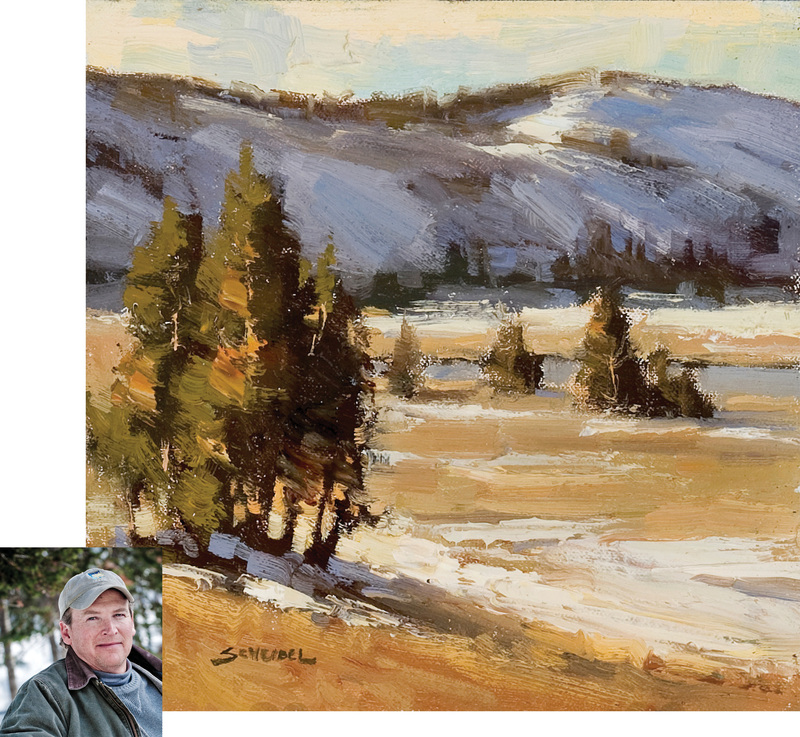 Ned Mueller and Brent Cotton are downhill from me painting next to an isolated pine grove. To my right Audrey Hall is taking pictures, while Matt Long, our snowcoach driver, talks with Greg Scheibel. Beyond them, Joyce Lee, Kathy Wipfler and David Slonim are set up with their easels in the open meadow. There is an easy grace to this scene. It is the third day of painting in Yellowstone, and at this point we’ve tapped into a fine artistic rhythm set to the metronome of changing light. Yellowstone’s storied connection to the arts began back in 1871, when Thomas Moran joined the Hayden Geologic Survey to explore the Yellowstone region. He returned armed with an extraordinary portfolio of watercolor field sketches, and with the help of William Henry Jackson’s photographs, Congress was convinced to set aside Yellowstone as the world’s first national park. 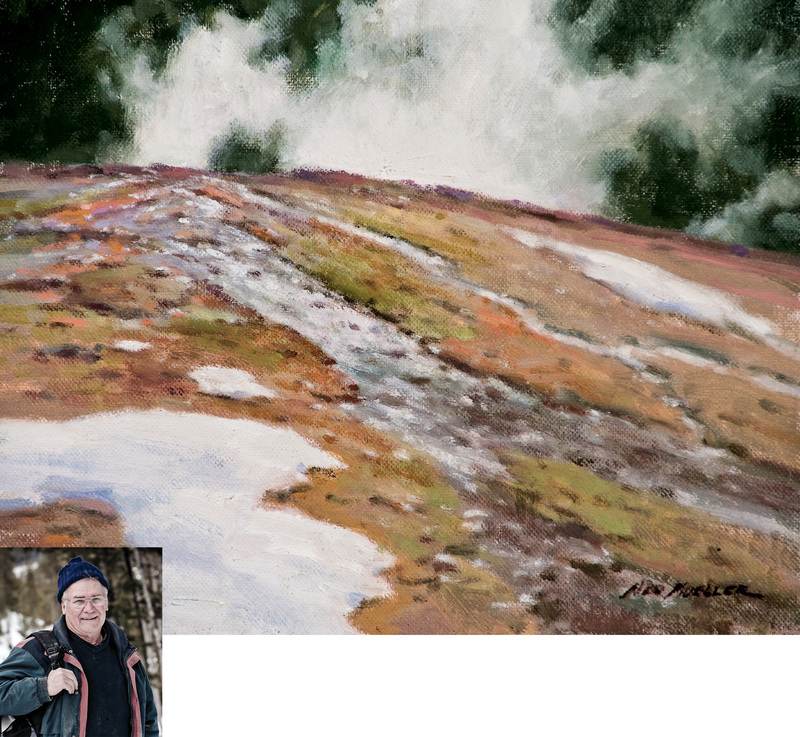 For more than a century Yellowstone has been a mecca for the artist, and yet if you could peruse the extensive portfolio of all the paintings ever done of Yellowstone, you would find one season conspicuously absent: winter. Yellowstone’s longest, and arguably most beautiful season, has rarely been painted. It’s not hard to see why. I mean, we’re talking winter at high elevation, not exactly the place for a casual outing. Just to get into the Yellowstone interior is daunting. Ever travel by snowcoach? Imagine a jacked-up van on tracks and you get the idea. Then consider standing behind an easel for a few hours looking into the glare of sun reflecting off of snow, painting with gloves on, trying not to freeze, and you get something of what’s involved in winter painting. It’s just not easy. So as I stood on that hilltop in the company of artists that I admire, I felt a joy as pure and clean as the blue sky arching overhead. 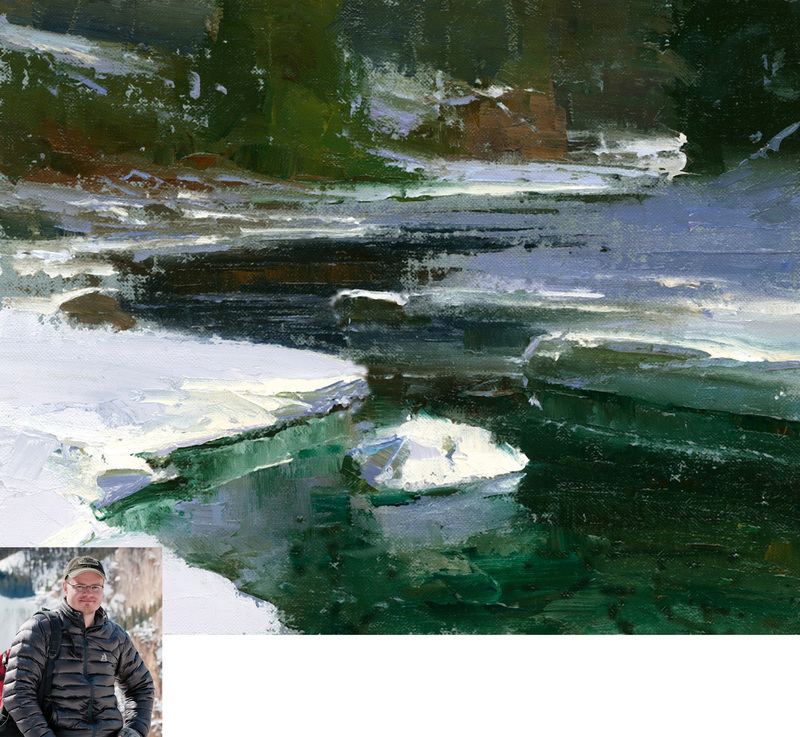 Six talented and slightly crazy artists had accepted my invitation to paint Yellowstone in winter. We had spent the first day painting from Mammoth to the Lamar Valley, the only stretch of Yellowstone open to vehicle travel in winter. The second day we boarded a snowcoach and painted our way down from Mammoth to Old Faithful. We stayed the next two nights in cabins at Old Faithful, painted the geyser basins, and toured out around Yellowstone Lake, through Hayden Valley, and finished with a painting stop at the Grand Canyon of the Yellowstone before returning to Mammoth. We painted from dawn to dusk each day, and we laughed a lot. What follows is a journal from the trip. Setting up to paint is a ritual that affords me enough time to consider the landscape. I pull the wooden pochade box from the pack, clip it onto a camera tripod, and fold it open. It’s an ingeniously simple setup, a slick portable easel that all fits into a daypack. The bottom of the box acts as a palette and the upright back has an adjustable shelf to hold an oil-primed linen panel. Attach a brush holder to the side, pull out a roll of paper towels, and I’m ready to paint. I stare at the snowy hillside, then the blank panel, run my fingers along the linen, imagining a high horizon, the purple of the distant hill acting as a counterweight to the open hillside, the pattern of golden light streaming over the top of the hill running at a diagonal skipping across sage, glinting off the upturned bits of snow, and rolling over granite boulders, the detritus of long extinct glaciers. I’ll start with the dark shapes of Douglas firs silhouetted against the pale blue sky, big obvious shapes that will anchor the painting. He finds them with the binoculars, smiles. “Sort of like pepper on a white tablecloth, isn’t it?” I protest, but I guess he’s right. As much as I want to stay and watch, it is time to go to work. So we drive up the road and find Greg and Joyce already started, while Ned and Kathy are painting further down the road. In the best of circumstances, in the comfort of the studio, creating something subtle and beautiful with crude brushes and messy oil paint seems improbable. Out here you have to have a sense of humor, and a willingness to take a few risks. “This is just a warm up, right?” David asks with a smile. “Just a warm up,” I assure him, “Let me know when we have to get serious, will you?” And so it begins. Books are cleared off, the table is set for a Mediterranean feast that I’ve pre-cooked, stuffed meatballs and a roasted eggplant stew. “The obvious choice for a winter painting expedition!” I proclaim. As we rumble along on the snow-packed road past Swan Flats I can feel the tension drain. My most nagging question has been answered: Can we fit everyone’s gear into the snowcoach? We turn in to the entrance of Indian Creek Campground, our first painting stop. The morning fog is lifting, revealing glimpses of blue sky above. Obsidian Creek turns in a slow bend, bisecting meadows pillowed by snow and reflecting the dark pines in an almost perfect mirror. 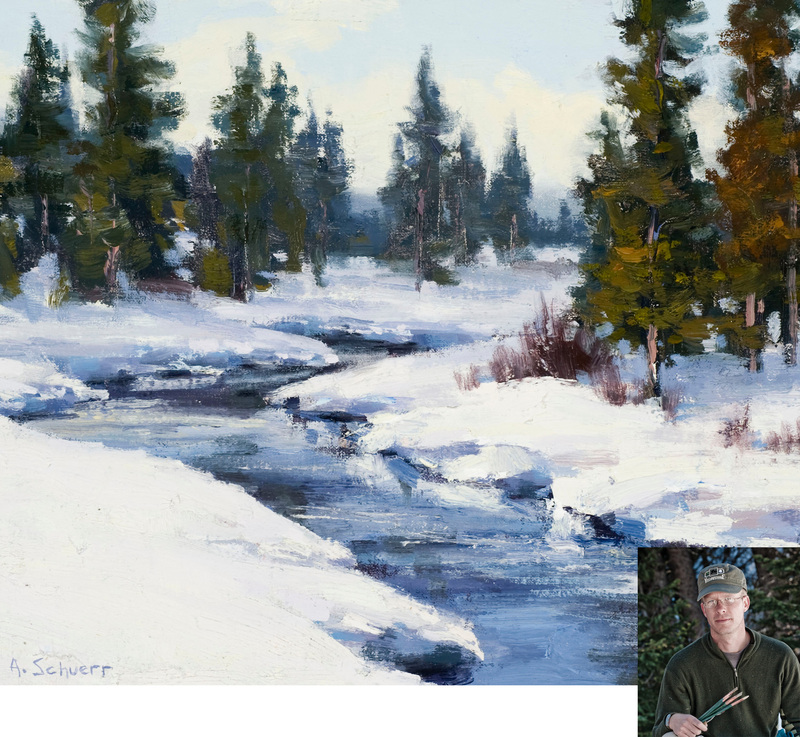 As I block in the painting I see Kathy tramping across the meadows in snowshoes, like an explorer out of some distant past. To my right Greg is painting the same slow bend in the river. He paints rivers with such grace and clarity, and I’m anxious to see what he produces here. Behind me Ned and David have set up next to a shock of red willows, and Joyce is painting about 50 yards down the road. I can’t believe that I’m here at this spot, in this season, with such fine company. In the late afternoon we pull in at Midway Geyser Basin for another painting session. Brent sets up just down the boardwalk from me, and works only with a palette knife. I take a break and walk over to his easel. He’s looking through the mist into the setting sun, and I’m struck by how “cottonesque” the scene is. (A personal definition: Cottonesque. Adjective. 1. Intensely concentrated morning or evening light, contrasted by deep, rich tones, and a strong atmospheric quality, imparting a feeling of calm tranquility to the viewer. 2. An uncanny ability to nail every single painting, much to the annoyance of other artists.) It’s all here, the mist-diffused sunlight, the dark ridge and the deep thermal pool rimmed by snow, as though ordered up for him, and Brent is painting a stunner. I hear David scraping the paint off of his canvas, muttering in a perfect imitation of a German interrogator, “We have ways of making you scrape!” I laugh and return to my painting. It happens to all of us, the hand just doesn’t seem to cooperate, and the best course of action is to scrape the paint off the canvas, wipe it down, and start again. His persistence pays off; for his third attempt he’s painted a close-up of the sunlight glinting off a snowbank reflected in a thermal pool, and it has an abstract beauty to it. The sun touches down as I paint in a few last details on my canvas. I run around the boardwalk snapping pictures of the sunset, feeling like I should give it all a standing ovation. As I return to clean up my palette and brushes and pack up, I hear a distant howling coming from the direction of the parking lot — serious howling. I get the point and hurry back to the waiting snowcoach. The wolves are hungry. It’s time to head to the Old Faithful Snowlodge, our home for the next two nights. We’re standing at the boardwalk at Old Faithful. Audrey has decided to take a group shot and painstakingly arranges us, like pieces in a game that only she understands. “You come forward a step. Kathy, move a little to your left. Another step. Good.” We wait. Old Faithful is taking its sweet time, and Audrey wants to have it erupting behind us. More waiting. Ned, who has complained of his coming 70th birthday, looks at Audrey and says casually, “Are you gonna take the picture soon? I’ve got to empty my colostomy bag.” We all double over with laughter. Later, Joyce has started a large painting focused in on a tangle of lodgepole pines along the banks of the Firehole River. I’m struck by the unconventional subject matter and her bold gestural approach. Diminutive and soft-spoken, Joyce is fearless. I remember eight or nine years ago, when I was first learning to paint, watching Joyce skip her brush through four or five piles of paint and then with a single short sweep of the brush she’d painted sage more convincingly than any rendering could have achieved. At that moment I realized what painting should be. A good painting should show some risk. “I’m not really interested in painting ‘recognizable’ scenes,” she tells me. Indeed, this view could be anywhere. I take a second look at the pines silhouetted by the rich blue sky. She’s right. We’re hunting for shapes and colors and something we can relate to, not postcards of something everyone already knows. On the way back toward Old Faithful we all agree that the real joy of this trip is that it’s purely about the art. We’re together, painting what we love, without any pressure. We have this impossibly large playground and no one is here. 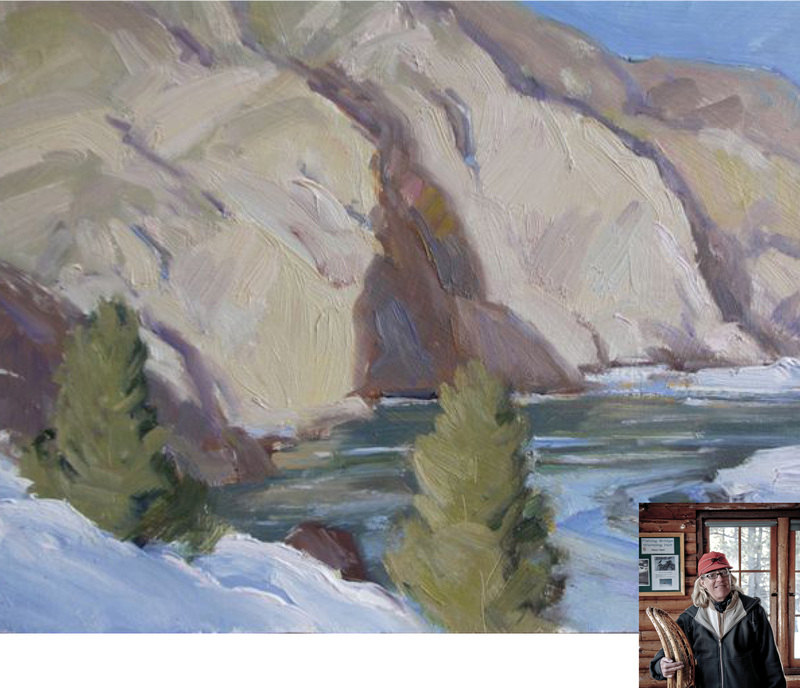 It’s about the landscape right there in front of us, and the painting on the easel, and nothing else. During dinner back at the lodge, Ned raises his glass in a toast: “To the best painting trip I’ve ever been on!” It takes my breath away. Ned has traveled more places than anyone I know: China, India, South America, Hawaii, Alaska, just about everywhere. As we drive past the immensity of Yellowstone Lake, I follow otter tracks on their serpentine path across the snow-covered ice to an open hole, where an underwater thermal has melted the ice. Matt speaks over the intercom about the geologic formation of Yellowstone Lake, the behavior of otters, and the tragic introduction of lake trout and its effect on fish and avian populations. He’s given us an impressive four-day lesson in the history, biology, ecology and geology of Yellowstone, and really, with his easy-going demeanor, he’s become a part of the group. We set up at Artist Point for our last session, the grand finale. In other seasons this place is crammed with tourists, but today we have it all to ourselves. 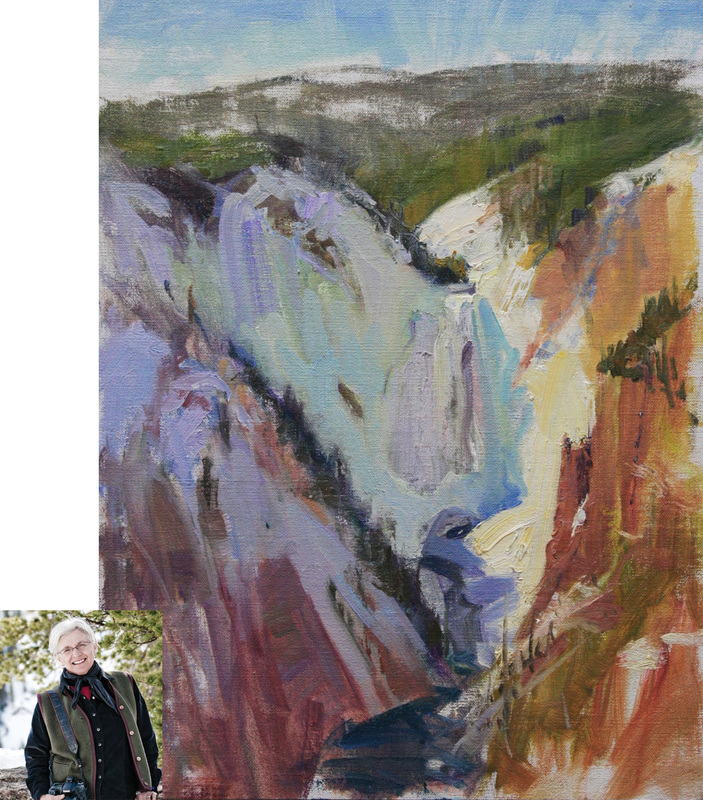 For years I’d assumed that this is where Moran gained his inspiration for his famous painting The Grand Canyon of the Yellowstone. Truth is, he never made it to the south rim at all, but through sheer wizardry he used watercolor sketches from the north rim and imagined the canyon from the south rim. The best art is a mixture of observation, memory and invention. Mr. Moran certainly never saw the falls emerging from blue-green ice and disappearing behind the skirts of a towering ice dam. Few artists have, and the view is stunning. If there is such a thing as artistic vertigo, then I have it. I’m overlooking a visual jigsaw puzzle and don’t know where to start. Ned’s the smart one in the group. Rather than facing the impossible canyon, he is painting the vertical yellow cliffs cascading down the snowy hillside. The wisdom of a veteran, I guess. He is a master of composition. Perhaps this is a result of the years he spent as an illustrator for Disney. It taught him to pick out the salient elements of the landscape and leave the rest alone. Audrey has been pulling artists aside to get individual portraits. 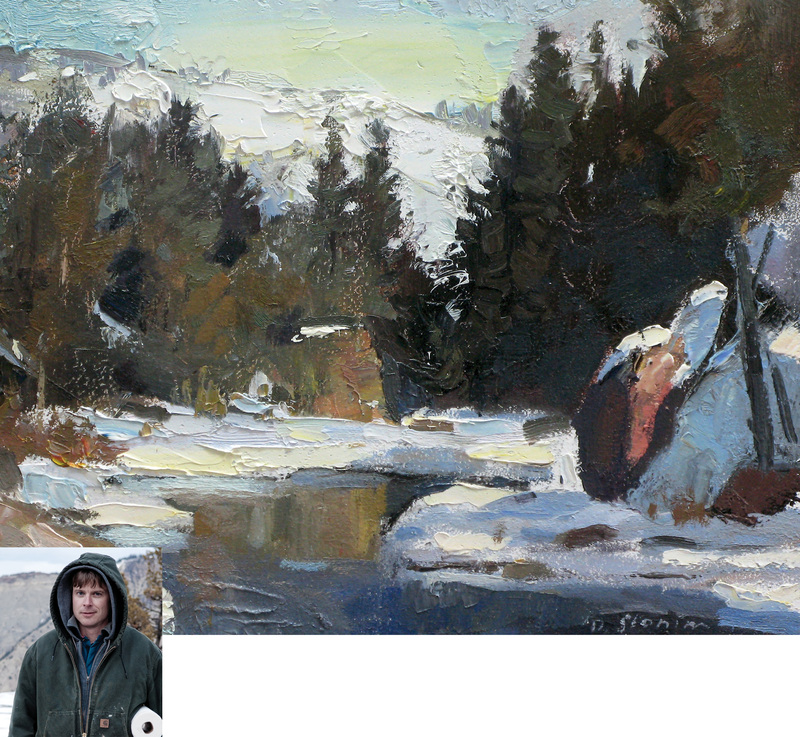 She asks to stop at Indian Creek to get the last portrait: David Slonim. She sets up at the Indian Creek warming hut, and David lays on the woodpile, vamps for the camera. Then he decides he wants the rugged look. “It comes from deep within,” I tell David. “Close your eyes and feel that inner-Fabio waiting to come out.” I demonstrate, throwing the camera my most absurdly intense gaze. He does one better, somewhere between Fabio and Austin Powers. Audrey laughs and shakes her head. David has kept us all laughing for four days, but he’s a problem child for the photographer. Back in the snowcoach Audrey shows me the pictures on her camera, a portrait of David standing in the cabin with the light streaming in from the window, looking serenely natural. “You’re a master!” I tell her. David has the same expression in the next picture, but Brent and Ned are making faces in the little square window behind him. Sort of sums up the trip: natural grace, hard work, and a lot of hilarity. We’re unloading gear, back in the parking lot in Mammoth. The snow has melted and the sky is grey. Our wet boxes are full of paintings, full of possibilities. Artists ought not to be alone so much. Soon I’ll have to check e-mails, make phone calls, finish frames, but for the moment I will linger on this: an improbable idea that worked. I think of Ned’s toast, “To the best painting trip I’ve ever been on,” and I agree. And the feeling that’s strongest, that almost overwhelms me, is gratitude.